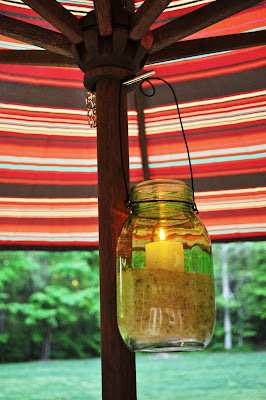 The Collected Interior: Diy Rewind...Fun Summer Projects! Wow...Summertime for our family has been crazy busy this year! Between kid two's Swim Team, Kid one's Baseball, getting together with friends, and just hanging out by the pool...my Diy to-do list is slow moving! So I thought I'd share some past projects inspired by the warm weather here in Charlotte and our love of...getting outside! Yup, revamping things around here doesn't just happen inside the house. Some of my favorite projects involve revamping things for our outdoor spaces. Here's one of my favorite seats in the house...our porch swing! When we bought our house 4 years ago, this swing was white and not workin' for me! I painted her black to better go with the orange and green colors on our screened in porch and deck. Here are my Pottery Barn Inspired Candle Votives. I bought these beauties from one of my favorite discount stores and the wire hangers were white. To warm em' up, I sprayed em' with my favorite Oil Rubbed Bronze Spray paint! Now if you look closely the bronze paint is starting to chip off. That's okay, in my opinion a little chippy paint adds age and character! We bought these Adirondack chairs several years ago from World Market. They were a dark wood finish, but within a year or two became gray and faded from the sun and elements...ugh! I spray painted them a vibrant red, added some great pillows (bought on clearance of course)...and I love them more now than I ever did before! And of course every great outdoor space needs some beautiful potted plants! This year is our first year using ferns to flank two of our entryways. If you've got shaded entryways and need pretty and low maintenance plants...then simple ferns are for you! I absolutely LOVE the colors you chose for your outdoor spaces... thanks for sharing! Everything looks gorgeous...I love what you've done with your outdoor space...don't you love spray paint? come by and visit with me sometime! I want to come live at your house, Jane. ;) I love your outdoor (and indoor!) spaces! These are great changes, Jane! 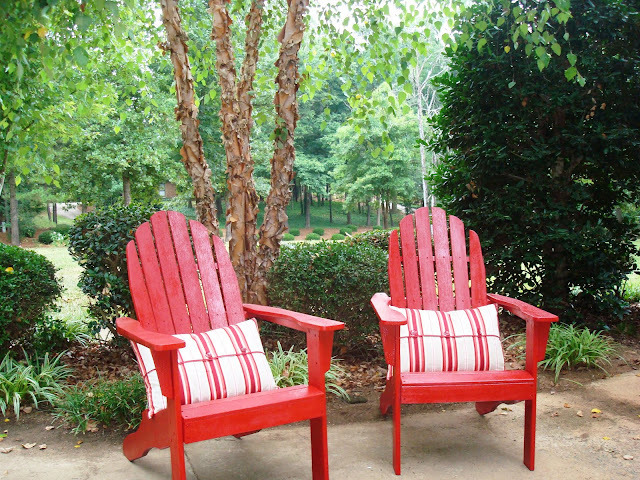 I love Adirondack chairs and it looks like the red is really holding up well on them. Love your swing too. Stunning! Love everything you've done! Now this is a gorgeous porch! You are amazingly talented! I love it all! I especially love the swing! So pretty and unexpected in black! Great project, love the Adirondack chairs and the potted ferns. Everything looks beautiful! Your home is lovely. Your spaces look so inviting. I adore those potted ferns- so regal looking. I love the colours that you chose for outside. I love the red chairs. I just did the same thing!! It looks great and I love the colors! Can I join you on the porch?!!!! Looks so pretty!!! JAAAANE!!! I love your colors and decorating style. Absolutely terrific and great inspiration! Great color choices!!! Love the red chairs!! Fabulous! You have fabulous taste. Love those fun red chairs. Everything looks so festive! 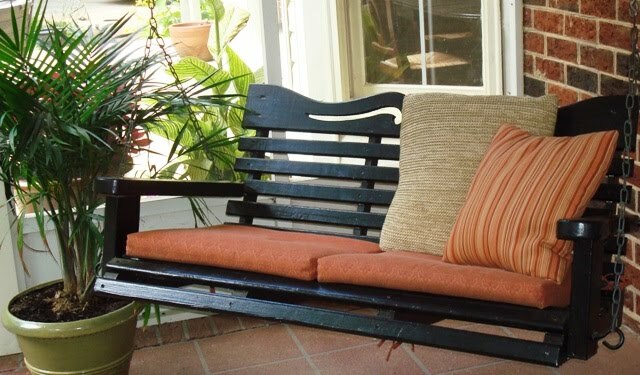 Love the black porch swing!! Your porch is beautiful! I love how you've made it inviting and cozy and colorful without spending a fortune. Great job! I painted my adirondak chair red last year, too! I love the wicker side table. I've been wanting to do something with a brown glaze soon so you've inspired me! You have a beautiful home! I think your decorating is fabulous. What a gorgeous home, and how perfectly Southern. The red chairs are the best!!! Everything looks so pretty you and spray paint ROCK! Wonderful! I love your outdoor space. I also have Kimberly ferns by my front door and love them. I don't think I've seen your living room before - I love it! I'm all about monochromatic color schemes! And your ferns are gorgeous. everything looks great! Love those red chairs. Love your color scheme and how you made everything work with it with a little bit of paint. Stopping by from Funky Junk's SNS party. Thanks for sharing your project!!! gorgeous! Your family room is so inviting! I loooove the botanical prints in the room next door(office?) Can you tell me more?? Love your blog! You have been a busy bee haven't you? I really love the candle holders and the green color of the wicker side table. I'm quite fond of green. Beautiful! I'm trying to hold off on taking my summer down this year - but you have me tempted to dive into fall! Yours is gorgeous! I love it! You have a beautiful home! OK, that is beautiful! Love it! Hello Jane, your revamp ideas look fabulous. Great design and not too matchy is a good thing. The wicker end table looks great in green. I really enjoyed all of your improvements. I love your inside and outside spaces. The swing and the porch are fantastic...and the red on the chairs is wonderful! You have a beautiful style. I just love those red chairs!! What inspiring outdoor (and indoor) spaces. I love ferns as well! So easy to take care of! Love the PB knockoff jars. Great ideas! I just found your blog and I love your projects! I do a lot of projects outdoors too. I'm also your newest follower - can't wait to see what other great ideas you have! Ooh those votive holders are great! I love your candle holders. So easy looking to do and they look great. Also love your red chairs with those great pillows. Partying with you today. Stop by for a quick visit. I am SO copying those jars!!! 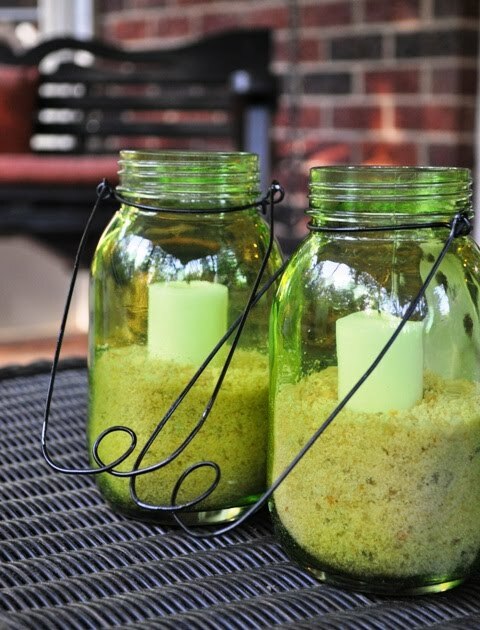 Thanks so much for linking up to gettin' crafty on hump day! I love those jars. The habitat restore in Greensboro had an whole aisle of mason jars I bought way too many. I never realized you lived in NC. I keep hoping they will hold a blog conference in NC. There are so many of us NC bloggers. Gorgeous. Your spaces look so warm and inviting. Enjoy! Everything looks os pretty and inviting. I love the colors. So pretty, I love your outdoor space! What a great outdoor space! 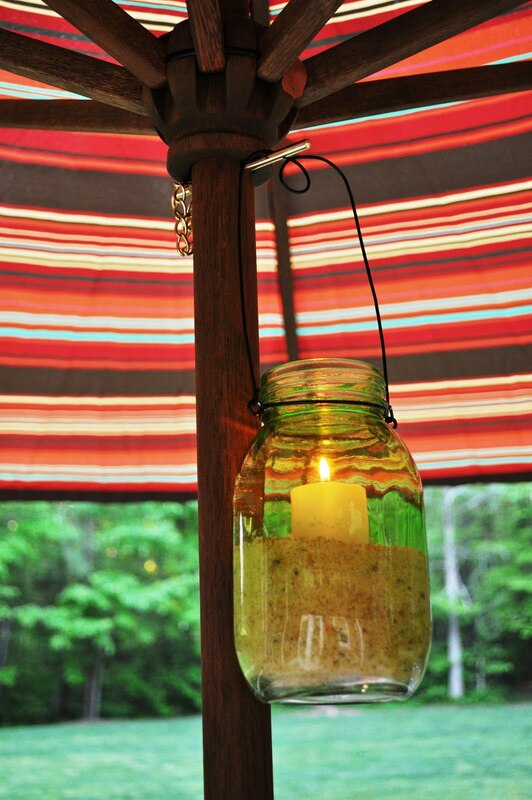 I love the votive's, along with the swing and Adirondack chair! Thanks for linking up to Topsy Turvy Tuesday! Beautiful! What a great space! I love your red chairs. Mr. SD made me some deck chairs, and we went with a lovely blue. Nothing like color to bring some pop to a porch. 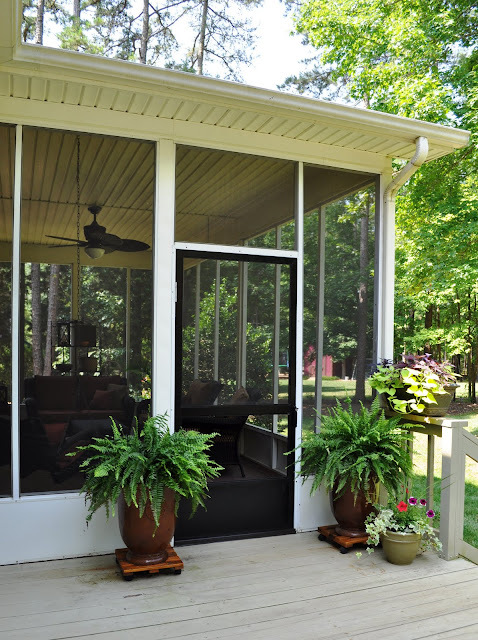 PS - I sooooo want a screen porch with our next house! Visiting from PonyTails and FishScales. OK...what discount store? I want some! Great project! And your home......stunning! Absolutley gorgeous! Thanks for linking to Thrifty Thursday on Tales from Bloggeritaville. Wonderful changes, Jane. I love the jar candle holders. I've made a few unique holders myself lately. It's really fun to scout around and see what you can use, isn't it? Thanks for linking to my party. I would love to have you join me for one, or all three, of my parties each week.